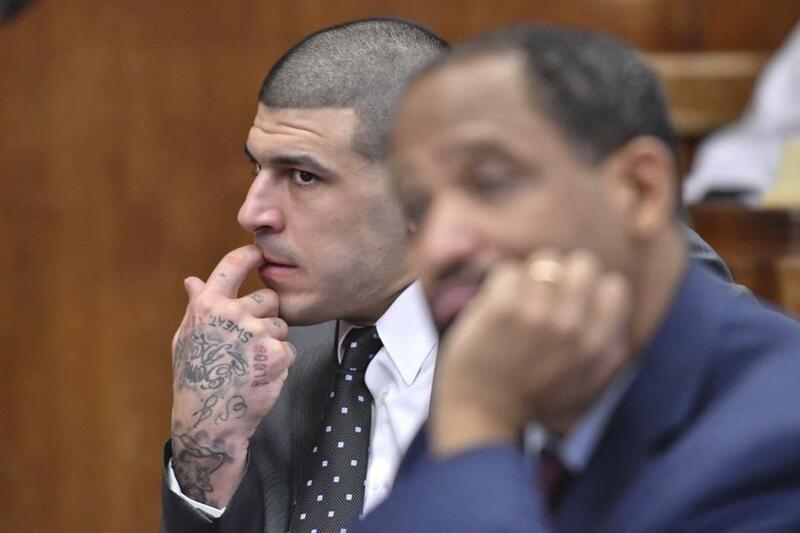 A judge ruled that jurors in Aaron Hernandez’s upcoming double murder trial can consider tattoos on the former New England Patriots star that allegedly link him to the 2012 murders. In a victory for Suffolk prosecutors, a judge ruled Tuesday that jurors in Aaron Hernandez’s upcoming double murder trial can consider tattoos on the former New England Patriots star that allegedly link him to the 2012 murders and to the shooting of a former friend in Florida in 2013. ■ One shows a six-shot revolver with five bullets in the cylinder and one empty chamber. Nearby are the words, “God Forgives,’’ written backwards so that they’re only legible when viewed in a mirror. Hernandez is charged with murdering Daniel de Abreu and Safiro Furtado in the South End on July 16, 2012, by shooting five times with a .38-caliber revolver that was later recovered by Boston police. ■ The second depicts a semi-automatic pistol and a spent shell casing with a wisp of smoke emanating from the casing. Hernandez is also charged with shooting his former friend, Alexander Bradley, in Florida on Feb. 13, 2013, in an attempt to silence him. Bradley was in the SUV with Hernandez at the time of the South End homicides, police say. Bradley, who was shot with a semi-automatic pistol, survived and is expected to testify against Hernandez. Hernandez, who has pleaded not guilty to charges of first-degree murder and witness intimidation, is scheduled to go on trial next month. Hernandez is already serving a life sentence with no possibility of parole for the 2013 slaying of Odin L. Lloyd in North Attleborough. In his ruling Tuesday, Suffolk Superior Court Judge Jeffrey Locke wrote that the Suffolk district attorney’s office argued the tattoo amounts to a confession by Hernandez for the two shootings. The judge concluded jurors can learn about the tattoos because prosecutors believe “they have special meaning and significance” to Hernandez. Locke also ruled that two survivors of the 2012 South End shooting will be able to describe what they recall of the horrific incident and can provide any physical description they can recall about the person they saw shooting into their car that morning. However, Locke ruled, the two men cannot identify Hernandez as the shooter in court because they admitted during an earlier hearing they learned about Hernandez after he was charged with murdering Lloyd in 2013. In other rulings, Locke determined that prosecutors will not be able to discuss Hernandez’s conviction for murdering Lloyd. The defense had argued it could prejudice the jury against him. He also impounded an affidavit the defense filed in connection with a motion to dismiss the charges because they cannot examine the BMW sedan the victims were riding in when they were murdered. Since Hernandez’s arrest for the Lloyd homicide, his tattoos have sparked the interest of law enforcement. The Bristol County sheriff’s department at one point studied Hernandez’s tattoos for evidence of gang affiliation. None was found. In May 2014, the Suffolk district attorney’s office issued an appeal for any person responsible for inking Hernandez to contact authorities. The office did not detail the reason for making the request but did set a time frame — between February 2012 and June 2013. After Hernandez’s conviction in Lloyd’s murder, the former athlete’s tattoos drew media attention when he appeared in court with the word LIFETIME embedded in a star on his neck. No explanation has been offered for the meaning of that tattoo. Andy Rosen of the Globe staff contributed to this report. John R. Ellement can be reached at ellement@globe.com. Follow him on Twitter @JREbosglobe.